The TrueLumen Pro LED Striplights from Current USA are comprised of a slim, extruded aluminum strip, packed with bright LEDs. The thermally efficient, water resistant LED light, is versatile, and can be applied in almost any application, be it store-use, canopy, or direct placement (on the aquarium). The aquarium LED lighting Strips come in four color options, appropriate for freshwater, saltwater, reef and planted tanks. 8,000K Sun White – the perfect spectrum for freshwater planted aquariums or refugiums. 12,000K Diamond White – crisp white, an excellent choice for enhancing colors in marine & freshwater fish. Provides bright, penetrating rays of shimmering light without growing nuisance algae. Marine Fusion – a slick combination of 12K white & 453nm blue. 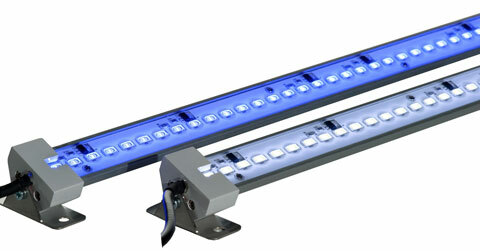 One strip will illuminate an entire aquarium with the perfect blend of light for marine fish & reef aquariums. Deepwater Blue – sharp 453nm actinic blue lighting for providing the necessary wavelengths for promoting strong coral growth & enhancing brilliant coloration. With low energy consumption and long bulb life, these LED strips might be what you’re looking for. Since the LEDs are protected by a silicone cover, they are completely water resistant. Powered by a 24 volt, low-voltage transformer, the units are linkable, allowing for easy expansion. Below you will find a color spectrum video. hello, Can you tell me how to use the Led strip in the nooks and crannies?